Dovetail is a completely reversible, textured cowl that can be knit in two sizes and worn several ways. 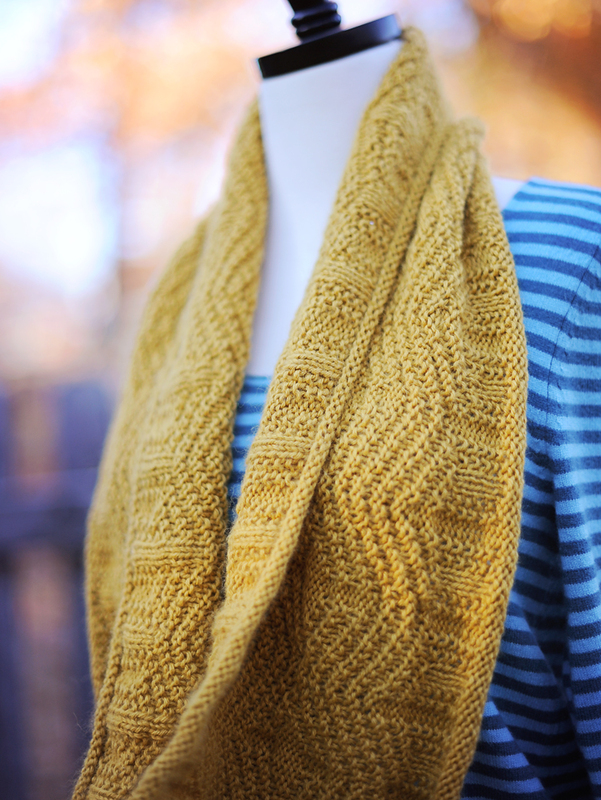 It is worked in the round from worsted weight yarn using only knit and purl stitches. Pattern includes written and charted directions and is simple enough for an advanced beginner. Yarn: In worsted weight yarn you will need approximately 220 (400) yards or 200 (360) meters. The gold sample was knit from Aslan Trends Royal Alpaca in Curry and the grey sample was knit from a single ply 100% merino. The stitch patterns will show best in a solid or semi-solid yarn. Needles: 16 (24)” circular needles in US7 (4mm) or size required to obtain gauge. Additionally, one needle two sizes larger than that used for gauge is required for binding off. Notions: 7 (13) stitch markers (optional, but recommended) and a darning needle for weaving in ends. In chevron pattern (page 2 for written or 4 for charted directions), 19 sts and 30 rows = 4” using the smaller needle size. You can check your gauge in stockinette too for simplicity’s sake. It will be more like 20 sts and 32 rows = 4” using the smaller needle size, which should work out to proper gauge in the chevron pattern.